Analysis: Mike Mayock is making a splash as a first-time GM, agreeing to terms of a trade for Antonio Brown this past weekend and inking Williams to four-year contract Wednesday. With Brown and Williams in the fold, the Raiders opted to cut ties with Nelson after just one season. Williams has experience complementing a top-tier wide receiver, averaging 42 catches (on 67 targets) for 690.5 yards and 4.5 touchdowns the past two campaigns behind the Chargers' Keenan Allen. Analysis: Williams, who caught 41 passes for 653 yards and five touchdowns with the Chargers last season, joins a revamped Raiders receiving corps that will be led by the recently acquired Antonio Brown. The fantasy prospects of quarterback Derek Carr are starting to look up thanks to the team's notable offseason upgrades. Analysis: Williams led the Chargers in receiving yards while tying Antonio Gates and Mike Williams for the team lead in catches, but that fact is little consolation given that his team's Super Bowl hopes were unceremoniously dashed in a game that wasn't nearly as close as the final score indicates -- New England led 35-7 at halftime. The 26-year-old wide receiver will try to use this productive outing to gain a bigger contract as an unrestricted free agent this offseason. 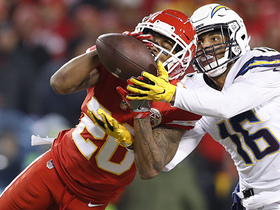 Analysis: Williams was on the field for 58 of the Chargers' 63 snaps on offense in Week 16, but was unable to muster much production, which has been the norm for him of late, with a six-catch, 71-yard effort Week 15 being his most recent outlier on that front. He profiles as a hit-or-miss fantasy option in the Chargers' regular-season finale this coming Sunday against the Broncos. Williams caught six of his 12 targets for 71 yards in the 29-28 win over the Chiefs on Thursday. Analysis: Williams was forced into the No. 2 role behind Mike Williams after Keenan Allen went down with a hip injury in the second quarter, and the 26-year-old promptly record his most catches and third-most receiving yards of the 2018 campaign. It's unclear how serious Allen's injury may be, but should the star receiver be forced to miss any time, Williams immediately becomes a viable fantasy option in nearly all formats, even with a difficult matchup against the Ravens defense on tap next Saturday. Williams caught all three of his targets for 14 yards in the 26-21 win over the Bengals on Sunday. Analysis: At this point, it's clear that Williams' run through Week 6 and 7, where he totaled 236 receiving yards and three touchdowns, was just an aberration. From Week 9 through Week 14, the fourth-year receiver has caught just 11 passes for 119 yards and one touchdown, remaining at best a longshot to post even adequate fantasy numbers. Williams (quadriceps) caught one of his two targets for 14 yards in Sunday's 33-30 win over the Steelers. Analysis: Williams played in 50 snaps Sunday, so it's clear the quadriceps injury that essentially forced him to miss last week's contest against the Cardinals is no longer an issue. 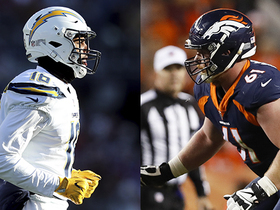 The 26-year-old has seen his fantasy value fluctuate throughout the season, but next week's matchup against the 31st-ranked Bengals' pass defense could wind up being a lucrative one for Williams and the rest of the Chargers' offense. Williams (quadriceps) is listed as active for Sunday's game against the Steelers. Analysis: Williams will give it a go Sunday night after logging a season-low nine snaps in Week 12, en route to going without a target. We'll have to see if he's up for much more work versus Pittsburgh, but Williams is a risky fantasy roll until he gets a full and productive game in. Williams (quadriceps) is listed as questionable for Sunday's game against the Steelers, Eric D. Williams of ESPN.com reports. Analysis: Williams will carry an injury designation into gameday for the second week in a row after the lingering quad injury limited his involvement in practices Wednesday through Friday. Though the questionable tag didn't prevent Williams from suiting up in last week's win over the Cardinals, he played a season-low nine snaps in the contest and wasn't targeted. Similar restrictions could be in place for Williams again this weekend even if he's active, making him a dicey option in fantasy lineups. Williams (quadriceps) was a limited participant in Thursday's practice. Williams (quadriceps) was limited at practice Wednesday. Analysis: Wiliams logged just nine snaps and zero targets in the Chargers' Week 12 win over the Cardinals, but there's a decent chance that he'll be up for more work Sunday against the Steelers. It remains to be seen, however, if he ends up listed as questionable for that contest or is removed from the Chargers' injury report altogether come Friday. Williams (quadriceps) did not record a catch during Sunday's win over the Cardinals. Analysis: Williams clearly wasn't entirely healthy despite being active Sunday, as the fourth-year receiver played just nine snaps. Getting what amounted to a week of rest should help Williams, though his fantasy prospects remain limited with Keenan Allen, Austin Ekeler and Mike Williams seeing the majority of the looks as of late. Williams (quadriceps) will be active Week 12 against Arizona, Eric D. Williams of ESPN.com reports. Analysis: Williams has yet to miss a game this season, but his status for this one was in question after failing to take the practice field Wednesday and registering limited sessions the next two days. He'll now be cleared to take the field against a tough Arizona secondary that ranks in the league's top 10 in fantasy points per game allowed to opposing receivers. Williams (quadriceps), who is listed as questionable for Sunday's game against the Cardinals, will test his injury during pregame activities before a decision on his status is made, Adam Schefter of ESPN reports. Analysis: Williams will need to demonstrate he can move at full speed in his pregame workout, otherwise he'll sit out Week 12. With the Chargers and Cardinals not kicking off until 4:05 p.m. EST, there's some risk in fantasy managers waiting on Williams' status if other options exist for the early wave of games. 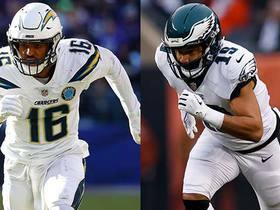 From the Chargers' standpoint, Mike Williams and Travis Benjamin would be ready to handle larger roles if Tyrell Williams can't go. Williams (quad) is listed as questionable for Sunday's game against the Cardinals. Analysis: Williams missed practice Wednesday, but was able to subsequently log back-to-back limited sessions. Official confirmation of his Week 12 status will arrive as Sunday's 4:05 ET kickoff approaches, but if he does play this weekend, Williams profiles as a decent fantasy option, while operating in the context of the Chargers offense. He's logged six targets in each of his last two games and prior to that he strung together four TDs over his previous three contests. Williams (quad) returned to a limited practice Thursday. Analysis: Williams didn't practice Wednesday, so the wideout's return to the field Thursday bodes well for his chances of suiting up Sunday against the Cardinals. We'll revisit his status Friday to see if he ends up carrying any Week 12 injury designation, or is cleared to play this weekend. Williams did n't practice Wednesday due to a quadriceps injury. Analysis: Williams was limited to just two catches for 22 yards in the Chargers' loss to the Broncos this past Sunday, but it wasn't believed that he sustained an injury during that contest. His appearance on the Week 12 injury report suggests otherwise, but the fact that Williams was at least able to participate Wednesday in a limited fashion suggests he'll likely be good to go this weekend against Arizona. 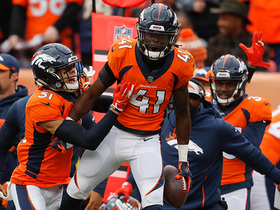 Williams nabbed two of six targets for 22 yards in Sunday's 23-22 loss to the Broncos. Williams caught four of six passing attempts for 46 yards in Sunday's 20-6 win over the Raiders. Analysis: Williams was unable to find the end zone in his fourth consecutive game but was still the second most involved wide receiver after Keenan Allen, though Melvin Gordon also saw six targets. The 26-year-old has only seen three targets in the red zone all season and therefore continues to depend on the big play to produce fantasy value. He'll try to break another at home Week 11 against Denver. Williams caught two of his three targets for 23 yards and a touchdown in Sunday's 25-17 win over the Seahawks. Williams caught all four of his targets, compiling 118 receiving yards and a touchdown during Sunday's 20-19 win against Tennessee. Williams caught three of four targets for 118 yards and two touchdowns while adding a one-yard run in Sunday's 38-14 win over the Browns. Analysis: Williams did most of his damage on a two-play scoring drive in the second quarter. He caught a 44-yard deep ball on the first play of that drive, then added a 45-yard touchdown in triple coverage on the very next play. Williams added a 29-yard score later in the quarter. It's tough to predict which Chargers receiver will pop on any given week, but Williams will be in the mix against the Titans in Week 7. Williams caught all three of his targets for 66 yards in the 26-10 win over the Raiders on Sunday. Williams caught three of his five targets for 48 yards in Sunday's 29-27 win over the 49ers. Analysis: Williams saw the third most targets Sunday, but he still failed to tally at least 50 receiving yards for the fourth straight game. Williams can take solace in the fact that none of his fellow teammates compiled gaudy numbers either, but fantasy owners hoping for a breakthrough contest against a depleted San Francisco team were surely disappointed. Williams caught two of this three targets for 22 yards and also carried the ball once for 14 yards in Sunday's 35-23 loss to the Rams. Williams caught all three of his targets for 48 yards in the 31-20 win over the Bills on Sunday. Williams caught two of his five targets for eight yards and a touchdown in the 38-28 loss to the Chiefs on Sunday. Williams (foot) isn't listed on the Chargers' initial injury report for Sunday's opener against the Chiefs. Analysis: Williams dealt with foot soreness in late August but was back at practice Monday. He and Keenan Allen are listed as the starting wide receivers on the Chargers' depth chart, albeit with Mike Williams and Travis Benjamin looming as serious threats to steal snaps and targets from Tyrell Williams. 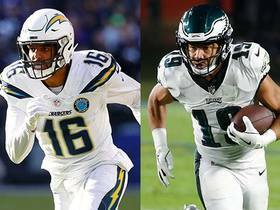 A matchup with the shaky Kansas City secondary could allow multiple wideouts to thrive Week 1. Williams (foot) practiced Monday, Eric D. Williams of ESPN.com reports. 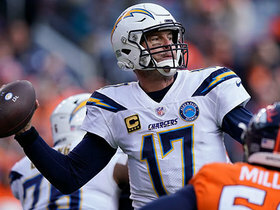 Analysis: Williams is definitely in the mix to see his share of targets from QB Philip Rivers this season, but consistent volume could be a issue for him, with target-hog Keenan Allen on hand, in addition to second-year wideout Mike Williams (a 2018 breakout candidate) and Travis Benjamin. Williams (foot) did not play in Saturday's preseason contest against the Saints, Jack Wang of the Los Angeles Daily News reports. Williams is dealing with foot soreness, Eric D. Williams of ESPN.com reports. Analysis: Williams was held out of practice Tuesday, but coach Anthony Lynn expects the 26-year-old wideout to be okay. Lynn also mentioned that Williams has been impressive at training camp, which is important given how much talent the Chargers have at wide receiver. Williams and Keenan Allen are listed as the starters on the team's preseason depth chart, but second-stringers Mike Williams and Travis Benjamin also figure to be key pieces in the offense. Analysis: It's not clear what Williams may be suffering from, as the 26-year-old appeared to leave Saturday's preseason contest unscathed. While the lack of followup information regarding Williams' injury likely indicates it's nothing serious, a prolonged absence could push preseason standout Mike Williams into a prominent role on the Chargers offense. Williams secured his only target for 21 yards in the Chargers' 24-14 preseason win over the Seahawks on Saturday. 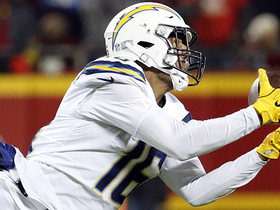 Williams and Keenan Allen are listed as the starting wide receivers on the Chargers' initial depth chart, Jack Wang of the Los Angeles Daily News reports. Williams has signed his restricted free agent tender, Adam Schefter of ESPN reports. The Chargers extended a second-round restricted free agent tender to Williams, Ricky Henne of the Chargers' official website reports. Williams, a restricted free agent, is unlikely to leave the Chargers, ESPN.com's Eric D. Williams reports. 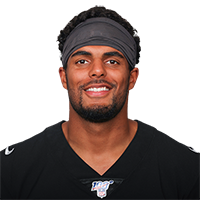 Williams finished the year with 43 receptions for 728 receiving yards and four touchdowns, including a three-catch, 67-yard performance Sunday against the Raiders in which he also snagged a touchdown. Williams caught five of his six targets for 50 yards in Sunday's 14-7 win over the Jets. Analysis: It was a bit surprising to see Williams receive six targets given the third-year receiver had only crossed that threshold once since the team's Week 9 bye. But with usual offensive stalwarts such as Hunter Henry (abdomen), Keenan Allen (back) and Melvin Gordon (ankle) either out or limited by their respective injuries, Williams has been forced into a larger role almost by default. As a result, the 25-year-old could wind up being a sneaky DFS play next week against the Raiders. 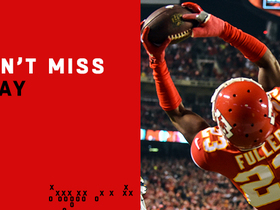 Williams caught three of his seven targets for 31 yards in the 30-13 loss to the Chiefs on Saturday. Analysis: With Keenan Allen (back) carted off to the locker room late in the game, Williams stepped up to see the second-most targets of any Chargers wide receiver, but he hardly made them count. If Allen were to miss any additional time, Williams figures to be a key cog in an offensive attack that has flourished in recent weeks. Williams hauled in four passes (on four targets) for 132 yards and a touchdown in Sunday's 30-13 win over the Redskins. Williams turned three targets into catch for eight yards in the 19-10 win over the Browns on Sunday. Analysis: Williams was used mainly as a blocking asset Sunday, once again seeing the second most snaps of any Chargers wide receiver while seeing a limited amount of receiving opportunities. With the fantasy playoffs nearing for many players, Williams is far too inconsistent to warrant much use except in the deepest of leagues. Williams caught two of his three targets for 58 yards and a touchdown in the 28-6 win Thursday over the Cowboys. Williams caught his only target for 11 yards in the 54-24 win over the Bills on Sunday. Analysis: Williams' abysmal stat line doesn't reflect his usage rate, as he was on the field for 61 of the Chargers' 74 snaps. 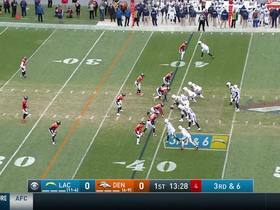 That was the best mark of any Chargers skill-position player, with Keenan Allen and Philip Rivers held out for the majority of the fourth quarter after the Bolts all but locked up the win before the start of the second half. It's quickly shaping up to be a disappointing season for Williams given the fact he has caught no more than two passes in each of the last four games. Williams snagged two of his five targets for 49 receiving yards in the 20-17 overtime loss to the Jaguars on Sunday. Kansas City Chiefs cornerback Kendall Fuller goes way up to intercept a pass from Los Angeles Chargers quarterback Philip Rivers. 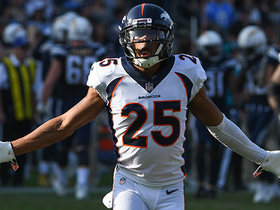 Denver Broncos cornerback Chris Harris intercepts Los Angeles Chargers quarterback Philip Rivers' pass.